Down at Frimley Lodge the course was drying nicely and 543 runners toed the line. First member to finish was Mark Foker in 25:51 which was a new PB in his 23rd parkrun. Tania Strange also scored a PB with 41:44 in her second parkrun. 371 runners tackled the Bracknell course and of the local events this was the most popular amongst members with 17 in action. The SJs were led home by Robert Jerrett who finished in 9th position with 20:50. Rushmoor was also busy with 479 runners in total. Many members made a repeat visit after last week’s pacing event including Charlie St Aubyn who ran his fastest parkrun at Rushmoor, his 2nd fastest ever and fastest since 2015 as he led home the twelve SJs finishing in 21:03. Blanche Barnes continued to improve with yet another PB in 25:48. It was a day of multiple PBs as Liz Ujszazi also recorded her fastest with 33:34. Mostly local parkrun tourism this week. John Tovell was at home at Crane Park, George Green at Homewood and Jon Green at Woodley. Over at Woking Neil Praine completed his 100th parkrun and celebrated with 19:16 for 6th place, which was his 3rd fastest ever. Furthest traveller was Connor Vine who warmed up for London at Bicester. 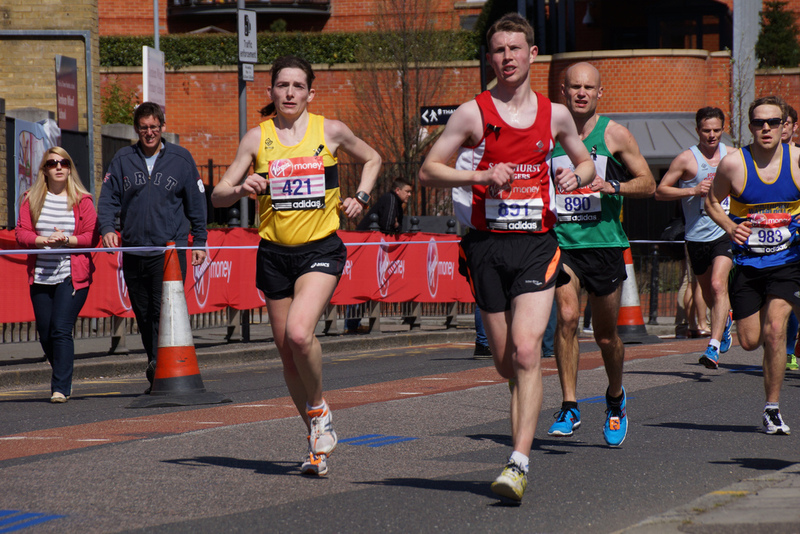 There were lots of members running, marshaling and supporting at the hottest London Marathon on record. The official results are below but they missed Aaron Fowler and his guide runner Mum Julie who finished in 5:27:24 as well as Gloria Long and Sam Goodall who finished in 5:38:49 and 6:48:00 respectively. Well have more from the runners themselves later in the week. London wasn’t the only race happening on Sunday and a couple of members tackled the Southampton Marathon. While a trio of members completed the Half Marathon. Wednesday: Sharon and Andrea are the General Members for Wednesday and they have great route planned for this week. Join them at Sandhurst Memorial Park at 7pm. The ‘5k to 10k’ course moves into its fouth week and will be aiming to help those members involved progress towards that 10k target. Thursday: This week the threshold/improvers run will be off road. Nikki will have details on the route later in the week. Meet at Sandhurst Sports Centre at 7:30pm and don’t forget lights and high vis clothing as it will still be dark on Swan Lane!